Janraj Avm Vikas Sansthan Recruitment 2019: Rajasthan Government has released an official notification to recruit the candidates for various job profiles. 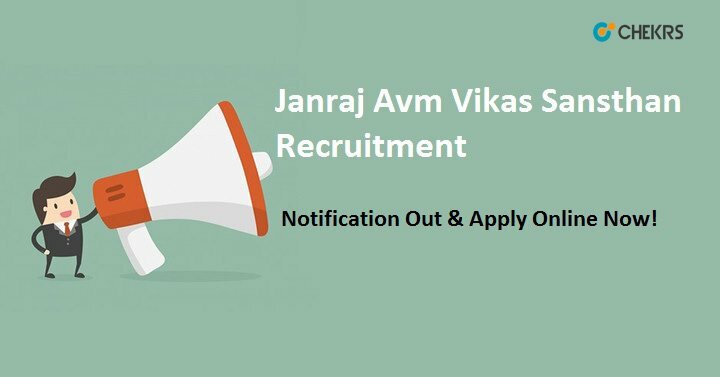 Candidates who are interested in they can apply for Janraj AVM Vikas Sansthan Recruitment 2019 Application Form within the stipulated time. The registration will be done only through the official portal. Other essential details regarding the Government Recruitment drive such as eligibility criteria, age limit, mode of selection and steps to fill up Application Form check through Janraj AVM Vikas Sansthan Vacancy Notification 2019. Latest Update: Rajasthan Govt is going to release the notification for Janraj Avm Vikas Sansthan posts. Interested candidates can fill the application form before the last date. The Janraj Avm Vikas Sansthan has been released Official Notification to fill up the various vacant posts. As per the official advertisement of Janraj Vikas Sansthan Recruitment 2019 candidates who will be selected under the Janraj Avam Vikas Sansthan, they will be offered jobs in private companies only. Candidates will be selected through an aptitude test which will be just a simple aptitude test. Further essential details of the Janraj AVM Vikas Sansthan Recruitment 2019 shall be as follows. (जनराज एवं विकास संस्थान भर्ती ): Skill development sector under the aegis of Janraj Avm Vikas Sansthan recruitment forms for various job profiles will be filled in online mode only. Steps that are registered to do the one-time registration for Raj Janraj Avm Vikas Sansthan Recruitment 2019 are covered below. Applicants must adhere to the eligibility criteria as specified in the official notification. Aspects of eligibility criteria are as follows. Applicant must be 10th/ 12th class passed from a recognized board. Candidate who possess ITI, Diploma Degree, Graduation and Post graduation qualifications are also eligible to apply. Candidates who are applying for the recruitment they are required to pay Rs 250/-. Selected candidates may be posted anywhere in India depending upon the requirement of the company. Candidates who are registering first time for such an advertisement they may follow the below provided instructions. Applicants who have registered online they will be called for an aptitude test followed by personal Interview rounds at Jan Raj Office. The round of Interview will be taken by Human Resource (HR) of Jan Raj and after scrutiny, the selected candidates will be directed to the companies for the recruitment. Note-I Interview camps and training sessions may be organized in various districts as per the requirement of aspirants. Note-II The registration process for Janraj AVM Vikas Recruitment is currently under process, If you have any questions regarding the job profile, feel free to discuss with us, our team will reply you shortly regarding the same.